My boys love Star Wars. Wait, is there a stronger word for love? If there is, that’s what they feel about Star Wars! 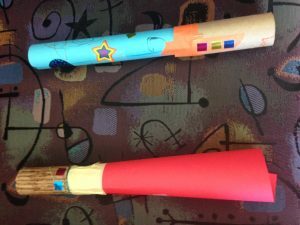 It’s almost an obsession, especially for my six-year-old. It’s what he likes to wear, watch, collect, play, et cetera. He almost lives and breathes it. And his younger brother may not feel as strongly about it as he does, but that younger brother of his does like it because he likes it. 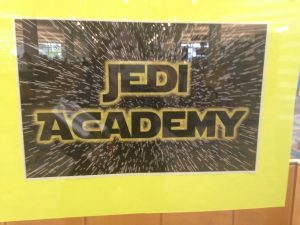 Anyway…the local library was doing a special event called “Jedi Academy”. I just had to bring my boys! We had no idea what to expect, but are glad we went. Upon arriving, we had to get a checklist of tasks each boy had to complete. When completed, a signature would go in the respective spot on the checklist, confirming they did, in fact, pass that part of their training. There were three training areas. One was an obstacle course where they had to practice shooting, tossing, throwing, jumping, and kicking. 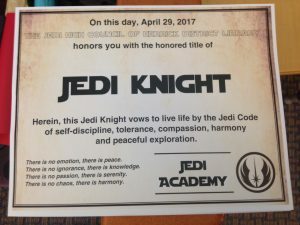 Another area was training the ability to use ‘the force’. Using teamwork, each young Jedi had to raise and lower a ball without the ball falling off its platform. 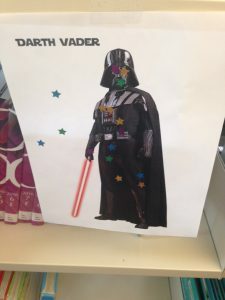 As you can see, many kids enjoyed taking a shot at Darth Vader! All in all, a great event. I appreciate the library doing things like this, getting kids involved in healthy activities, and hopefully, getting excited about the library itself. I know my boys walked out of there with some books to read! And, yes, I need to get them there more often! And though this was fun, one day I hope to take my kids to the Star Wars-themed land down in Disney World that is set to open in 2019 or so. That would be super enjoyable for us all!